A SOLEMN prayer gathering at St Matthew’s Church Page last month will serve as an expression of hope that healing will continue. 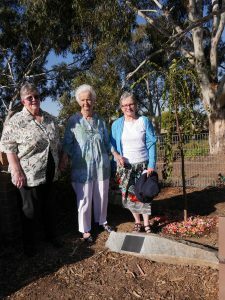 Archbishop Christopher Prowse blessed a memorial plaque during the liturgy, while members of the South Belconnen Parish planted a weeping cherry tree in the church grounds. The tree is expected to bear white flowers in Spring, representing sadness, innocence and hope. Members of the Church in Page initiated the latest gathering in direct response from the old parish of St Matthew’s following stories of sexual abuse which took place in the 1970s. These stories were brought to light in the 1990s and a healing Mass was held in 1994. Beth Gibson, from the prayer gathering subcommittee, said the purpose of the initiative is to create a space in the garden at St Matthew’s where people who told their stories of abuse can be assured they have been heard and acknowledged. “It is also a space where families and friends of those children can feel remembered,” she said. Mrs Gibson says the subcommittee have also proposed a special liturgy on an annual basis to remember those who suffered abuse at the hands of clergy, furthermore that they be remembered in the prayers of intercession at Mass. Relationships Australia Canberra and Region: (02) 6122 7190 or 1300 364 277.